ALIP is the first company in the world to develop a refined aluminium accommodation module, known as the Type 5-A design. This lightweight, corrosion resistant module can be delivered either fully outfitted or ready to outfit. Its modular design allows quick fabrication and assembly and is the fastest way to build a multi-level accommodation unit. The module can be equipped with a fire rating up to H120 and a corresponding blast rating. ALIP’s modular solutions will address the growing market in Asia with weight saving modules which allows future project extension contingences as well as environment friendly production. 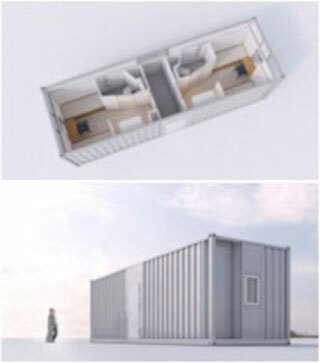 Artist’s impression of how the Type 5-A aluminium living quarter module looks like.